The east shore of San Francisco Bay, long known as the East Bay, was served for almost 80 years by a network of streetcar lines, both for local service and to bring passengers to ferry piers for travel to San Francisco. The first of these local car lines began horsecar service in 1869. As the years passed, more and more lines were built, some of them cable cars, with several different track gauges. In 1891, the first electric streetcar service began in Oakland. About that same time, entrepreneur and mining millionaire Francis Marion Smith emerged upon the scene. Often called ''Borax'' Smith for the source of his fortune, he began to buy up and combine the many independent streetcar lines. All were gradually changed to a common track gauge and those not already electric-powered were electrified. Smith was an investor in many realms, not least real estate development. Often a streetcar line would be built in conjunction with the opening of a new real estate subdivision. Smith's empire would become the Key System, with two divisions, one providing local streetcar services, and the other with express trains connecting to the ferry piers and later to transbay trackage on the new San Francisco-Oakland Bay Bridge. This book is the history of the local streetcar lines. 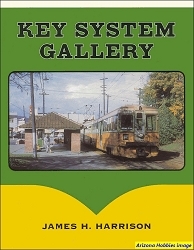 In addition to car line history, much of this book comprises descriptions of individual streetcar routes, which include many historic street scenes. Supplementing the text are 47 maps, along with graphics and ephemera, and 778 photographs (45 in color), most of which have never been published. A bibliography, extensive equipment rosters, and detailed index round out this Volume. The late Vernon Sappers worked for years on this comprehensive history of the Key lines. The result is an outstanding work of local history. Those interested in the history of East Bay cities, and of course streetcar fans, will be sure to enjoy this book. Signature Press, hardcover with jacket, 8.5 x 11 x 1.75 in., 480 pages, 778 photographs (45 in color), 47 maps, artwork and drawings, complete rosters, bibliography, index.